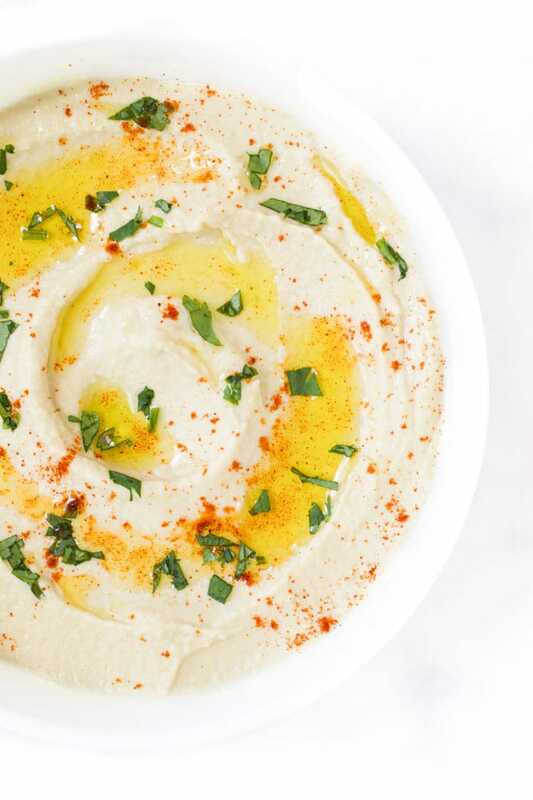 Hummus is a Middle Eastern dip made from chickpeas, garlic, lemon and tahini. It is great for dipping vegetables into but also tastes fantastic on toast, pizza or as a sandwich filling. I started making my own hummus when Finn, my eldest, was a baby as I wanted to eliminate the salt that can be found in shop bought versions. Even though both my kids are now older, and passed the stage where I have to worry about sodium content, in the same way, I still like to make it myself. 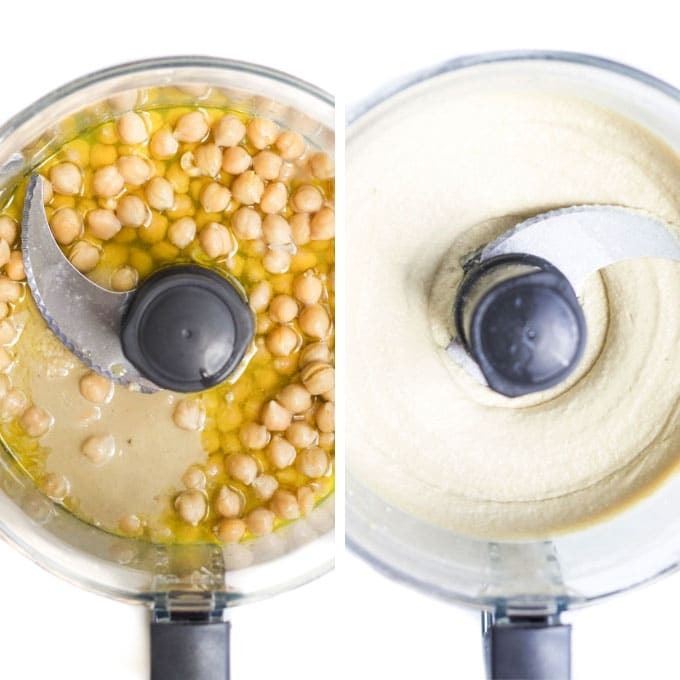 There really is only a couple of steps when it comes to making hummus. Some other recipes have extra steps, such as removing the skin of the chickpeas or boiling them in sodium bicarb, but unless it significantly affects the taste/texture, I’m all for the quick route. This simple method still tastes delicious and can be whipped up in minutes. I’m all about convenience when it comes to chickpeas and always used canned. I’d love to say that I buy dried chickpeas and soak overnight but that would be a lie. I’m just not that organised and don’t feel like the extra effort would be worth it. Some people swear by taking the skins off the chickpeas, to make an extra smooth and creamy hummus. Again, this is a step that I don’t feel is worth the effort and I never do. When buying chickpeas, have a quick look at the ingredient lists. 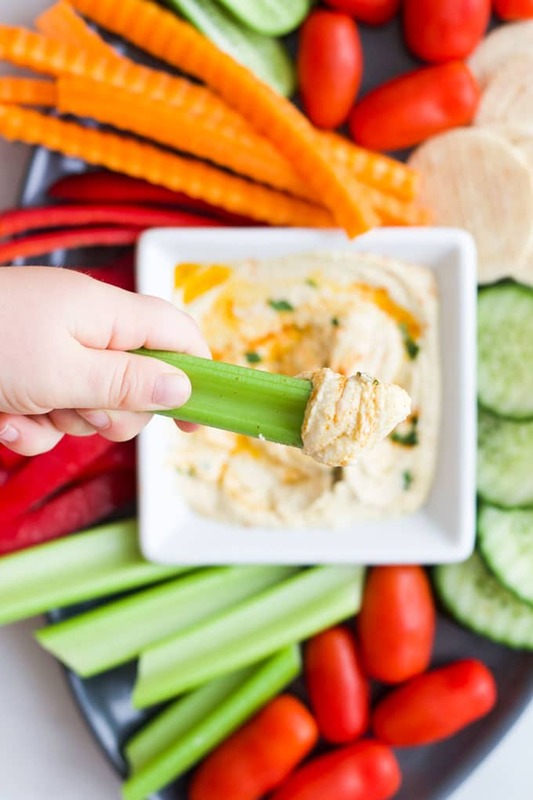 Different brands can vary in sodium levels and when making hummus for babies/ young children you should look for a brand with lower sodium content. Tahini is sesame paste and a key ingredient in hummus. You should be able to pick it up in most supermarkets or health food stores. Some brands have a tendency to separate so give it a good mix before adding it to the hummus. Tahini does have a particularly strong taste, my kids prefer when I make hummus with only 1 tablespoon of tahini, but if I was making it for just myself I’d add another couple tbsps. The strong taste of tahini may be unappealing to some young kids. If it is your first time trying it, I recommend starting with only a teaspoon or two and adding more, if your kids like it. Fresh lemon juice is best, store bought lemon juice never tastes the same and will affect the overall taste of your hummus. I love the taste of lemon but everyone is different. You can always start with a little then taste and readjust. Hummus traditionally contains some salt and it really does enhance the flavour. However, you should leave the salt out if you’re making it for babies and toddlers. If you are making for the whole family, you can separate out your baby’s portion and then add salt to the remainder. 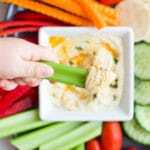 A dip for veggies, crackers, pitta bread or falafel. A spread – Great on toast or as a sandwich filler. A pizza topper – Replace the tomato sauce with hummus and top with roasted veggies, yum! An ingredient – Add it to mashed potato, blend with egg yolk to make devilled eggs or mix it into a salad dressing. Keep in an airtight container and refrigerate for up to 3 days. I don’t ever freeze hummus but it can be done. Freeze it in small portions in air tight containers. Pour a thin layer of olive oil over the top of the hummus, before freezing, to prevent moisture loss. Freeze up to 3 months. The dip may separate, once defrosted, but a good stir will solve this. Have you tried this recipe? I love receiving your feedback, please rate and leave a comment below or tag me on Instagram. 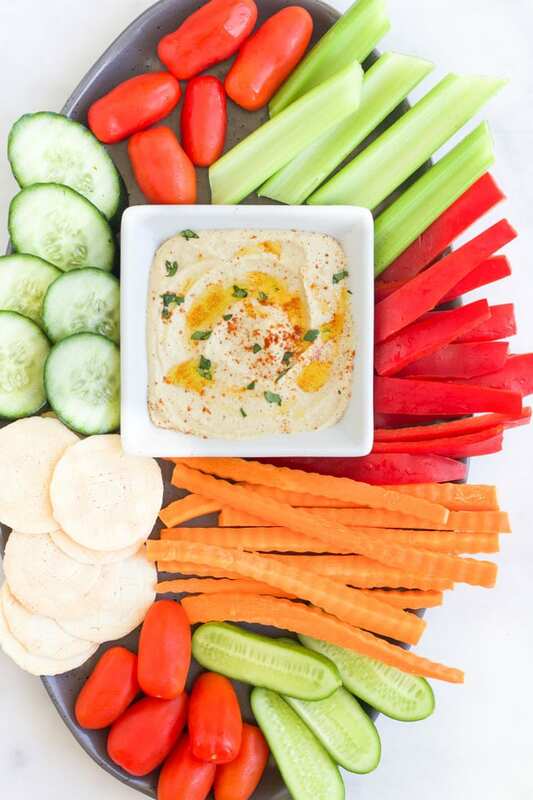 Hummus is a Middle Eastern dip made from chickpeas, garlic, lemon and tahini. It is great for dipping vegetables into but also tastes great on toast, pizza or as a sandwich filling. Canned chickpeas can vary in sodium levels, check the packaging a choose low sodium versions when making for young children. Fresh lemon juice works best, bottled lemon juice will alter the flavour. Tahini has a strong taste and may be overpowering for some children. If your children have never tried it before you may wish to start with a tsp and work your way up. A little salt really does bring out the flavour and makes a difference to the hummus. Remove a portion for a baby / young child and then season to taste. Nutritional information is a ROUGH guide only, calculated using an online calculator.